Friends for Our Riverfront: "Blacks Living Green"
Who said blacks aren’t interested in “green”? 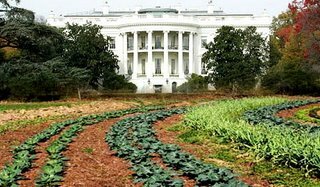 Michelle Obama is planting a vegetable garden at the White House, and Sharon T. Freeman, author of the myth-bursting book, “Blacks Living Green” will be in Memphis Apr. 9th to recognize 10 local “green” role models. You’re invited. Click “read more” to get the details. Keynote speaker: Sharon T. Freeman, PhD, lives in Washington, DC. where she has worked as an Economic Development Specialist helping developing countries around the world for the past 35 years . She has been a consultant and Advisor to the U.S. Secretary of Commerce, U.S. Trade representative, and a member of the U.S. Diplomatic Corps. Today she has turned her attention to the state of Black America in urban areas. She quickly tears down stereotypes and dispels myths that depict African Americans as uninterested in green issues and environmental matters. And on the national scene: Michelle Obama has dug up a patch of the South Lawn to plant a vegetable garden, the first at the White House since Eleanor Roosevelt’s victory garden in World War II. There will be no beets — the president does not like them — but arugula will make the cut. Click here to see which other presidents have had vegetable gardens at the White House.